Oeroeg is a Dutch movie from 1993. The English dub is called Going Home. It is filmed in The Netherlands and in Indonesia. It is about a soldier in the Dutch East Indies. 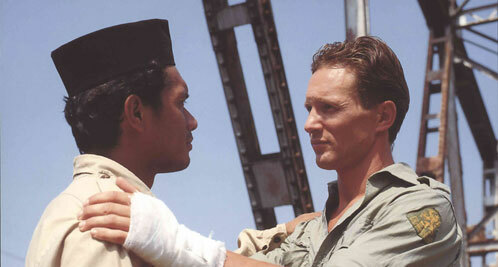 The movie was made a while after Indonesia became independent, and during this time a lot of Dutch people felt guilty. This shows in the movie by portraying the Dutch people rather cheeky against the Indonesian population. The movie does a great job at displaying the setting in Indonesia during the Dutch East Indies time. The movie is a film adaption of a book with the same name. 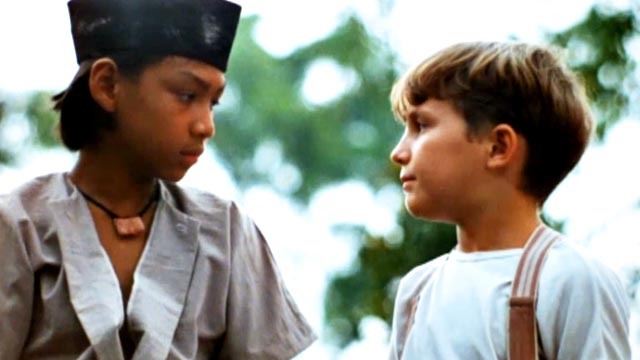 The movie is about Johan, a Dutch boy who grew up in Indonesia where his father owned a large piece of land. Johan was best friends with Oeroeg, an Indonesian boy who was also the son of Johan's family's servant. They play together all the time and Johan treats Oeroeg as an equal. Johan seems the only person who thinks they are equal, all of Johan's Dutch friends and even Johan's father see Oeroeg as less than Johan, and they don't want them to hang out so often. An example of this is when Johan and his Dutch friends are playing tennis, and Oeroeg shows up, the Dutch friends say he can be the ball boy. When Johan and Oeroeg are playing on a fleet, Johan falls in the water and wakes up in his bed. When he wakes up he is told that Oeroeg's father died while saving him. His leg got stuck in the seaweed. Now the movie switches to years later. The Netherlands and Indonesia are in war, and Johan is a Dutch officer. He is sent to Indonesia, he is rather excited about this because he can see his father again. When he goes to his fathers house, there is a sign saying it is dangerous to go further on this road. Johan orders a soldier to stay here while he goes on his own. When he is almost at the house, an Indonesian jumps out of the bushes and keeps Johan under fire. It takes a second before Johan realizes it is Oeroeg. Just when he wants to say this, Oeroeg gets shot at by a sniper. Oeroeg quickly flees and Johan moves on to the house. When he arrives at the house, his father is nowhere to be found. He keeps shouting his name but gets no response. When he moves on to the porch he sees his father dead in a chair. Judging by the blood, Johan can tell his father just got killed, so he knows Oeroeg did it. He takes the family heirloom and returns to the army base. The officers ask some questions but Johan can't tell where he has been, so he gets in trouble for being to suspicious. There is another time switch, back to Oeroeg and Johan, all grown up now. They want to go to the movies, but when they are there the Dutch and Indonesian people have to go in separate lines. This is because the Dutch people get normal seats, while the Indonesian people have to watch from the back of the screen. There are no seats and the movie is mirrored. They both try to go to the Dutch room, but Oeroeg gets declined, so he offers to go to the Indonesian room. Johan doesn't want this, so he makes up an excuse that he has to go home, but secretly goes to the Dutch room. When the movie ends, Oeroeg notices Johan in the Dutch room and is very mad. Back to the war; Johan questions a nurse and finds out she has contact with Oeroeg. They meet at a special place, the place where Johan nearly drowned and where Oeroeg's father died. When he gets there, he sees it was a set up and they kidnap Johan. He sees the kidnapper, it is Linda, his old teacher, who now works with the TNI (Indonesian National Armed Forces). Johan asks Linda why Oeroeg killed his father, but she says Oeroeg was taken captive a couple of weeks ago, so he couldn't have done it. She also tells him why they kidnapped him, they are going to trade him for 12 Indonesians (very unfair trade, shows that Dutch people were considered 'worth' more than Indonesian). At the exchange point Johan sees Oeroeg, the real Oeroeg. Johan asks if they can ever be friends, and Oeroeg says: “Zolang 12 Indonesiërs gelijk staan aan 1 Nederlander niet” (“As long as 12 Indonesians are equal to 1 Dutch person, we can't”). Johan thinks for a while, and decides to give him the family heirloom, to say he sees Oeroeg as family. Oeroeg accepts it and they are friends again. In one word: yes. The movie is historically very accurate, and really shows how oppressed the Indonesians were. It also gives great examples of the hate from the Indonesians towards the Dutch people, and how poorly the Dutch treated the Indonesians. The Dutch people are portrayed rather cruel, and this shows that there was a lot of guilt with the Dutch people, since the producer was Dutch. Definitely watch this movie if you are interested in the Dutch East Indies!